An ePortfolio is a collection of student work that is used to document effort, progress, and achievement over time. Students become actively involved in their own learning as they engage in goal setting, decision making and self-reflection. ePortfolios are powerful tools for authentic assessment because they require teachers and students to dig deeper than a multiple choice test. As we scramble to fully implement the Common Core Standards, ePortfolios can be an extremely useful tool to help students develop skills necessary for success in school and beyond. I have been an advocate for using ePortfolios for authentic assessment for quite some time. While I have made several attempts to help teachers learn to design and mange ePortfolios using a variety of digital tools to accomplish the task, I’ve discovered that teachers don’t always have the time or patience to see it through. I’ve come to the conclusion that if we are going to use ePortfolios as a standard assessment tool, the teacher buy-in needs to begin with a tool that is easy to use. Fortunately, I have recently discovered Open School ePortfolio and I am excited about the possibilities it offers. Open School ePortfolio is a free and user friendly CoolTool designed to help teachers and students easily manage the portfolio process. Teachers can sign up for a free account and use the built in tools to add students to classes without requiring a student email address. Teachers can create projects that can be assigned to specific groups of students for differentiation. There is also an option to improve the home school connection by inviting parents to login in participate in the process. When creating projects, there is an option to create a grading rubric. 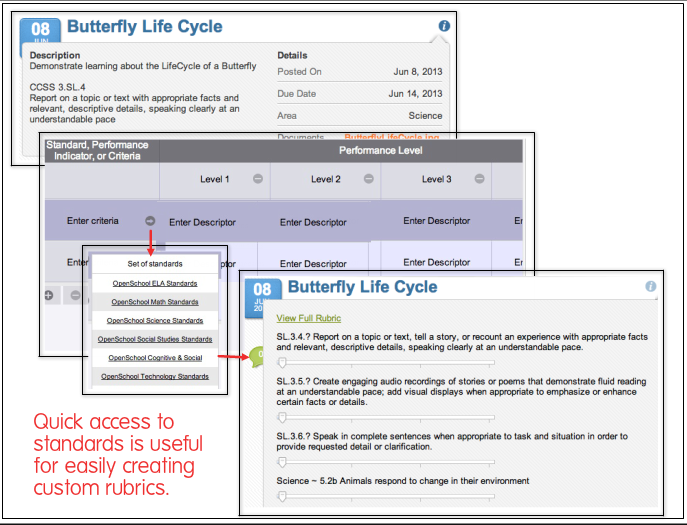 The rubric creation process is streamlined and easy to use. It includes drop down menus with CCSS Standards for ELA and math, and it also includes standards for other content areas that have been assembled by Open School ePortfolio. Rubrics are easily visible to students with each assignment for use as a guideline for meeting goals. The built in rubric creator is certainly one of the best features of Open School ePortfolio. As a student tool, ePortfolio is easy to use and designed for success. When students log in they receive notifications about new projects with a link for viewing. There is a goal setting area to immediately prompt students to reflect on their learning goals and motivate them tool to invest in their own learning. Students can complete the assignment or projects by contributing text, images and video, which makes Open School ePortfolio a flexible tool to meet the unique learning styles of all learners. Submitted projects can be easily graded by teachers through the use of sliders connected to the rubric. 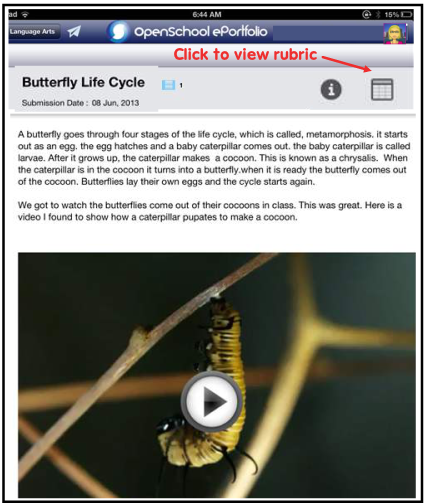 Graded project rubrics are automatically visible to students and notifications are sent when the process is complete. Teachers can also initiate digital discussions with students about their work through the use of a comments feature. Open School ePortfolio works on any computer with an Internet connection and there is also an iPad app that makes the tool easy to use, even for younger students. The iPad app provides students with the ability to capture video with the click of a button, useful for capturing and reflecting on the wonderful learning going on in the classroom every day. 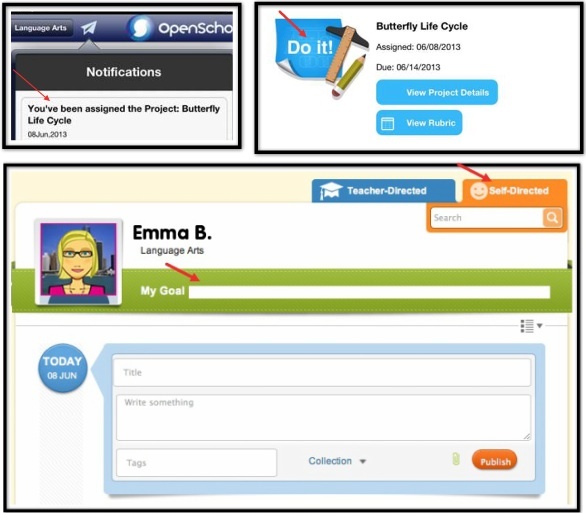 The Open School ePortfolio App is free and available in the apps store. As someone who has worked with eportfolio tools for the past 10==15 years, I was surprised to learn about this tool. I usually try to stay on top of eportfolio tools and this is a new one for me. I marked it as one I would want to look at (especially since it works on desktops and has a mobile app)Thanks for reviewing it.